Global Architect with a Mission! Last month did a project with Fast Company Magazine. 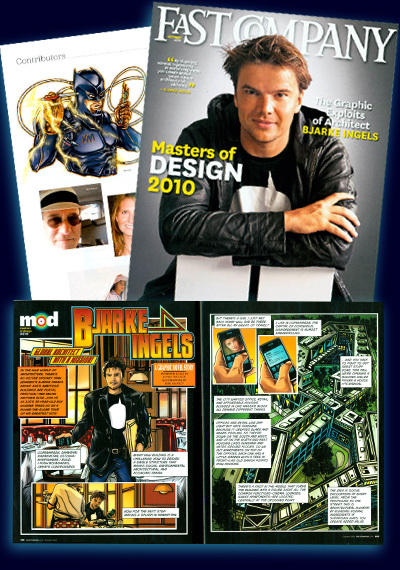 They had a special section in this years Mastors Of Design issue that featured trend setting Designers. One of their subjects was an interview with Dutch architect Bjarke Ingles. They asked me to treat the interview in a graphic Novel style. A GIF of the pages is posted below. To see and read the actual 8 page comic on line at their site click HERE. Use the arrow keys on your keyboard to navigate and read the story when you get there. Just finished a series of illustrations for Fast Company Magazine. They are for an article in their March issue on the Disney company. 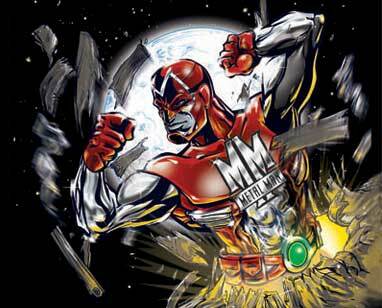 This was a lot of fun, as well as a perfect union of my traditional illustration work and my love of comic books. Larger versions can be seen in the Main Gallery. A couple reviews for the Western antholgy have posted recently on the inter-tubes. News-A-Rama is a great comic and entertainment site. If you dont have them book marked you should. Flick Cast is new on the scene and they are quickly becoming one of the big guys. Only a few days left to get your June order in and help Western hit the order number neccassary to get it distributed here in the states. :-) Just tell your local comic shop the Diamond order code JUN090671. Thanks. Western made it into PREVIEWS!!! 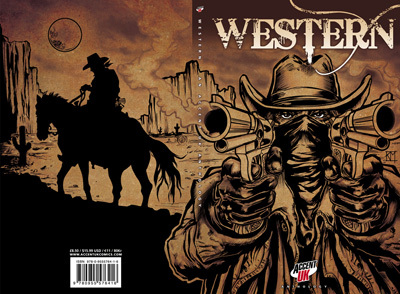 British Publisher AccentUK's Western anthology is in Diamond's comic book catalogue, PREVIEWS this month (June). 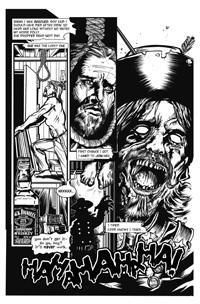 The very talented and critically acclaimed writer Dwight MacPherson and I did a wonderfully gruesome story for Western. Our story is a tale of retribution in the EC vein titled “The 7th Will Rise Again.” I also illustrated the books front and back cover. It looked like Western would only see distribution over seas. So this is good news. The twist is that orders have too meet the new Diamond order requirements or they will not fill the orders and Western will not be distributed in the states. You can use the Comic Shop Locator to find a shop near you and ask them to order you a copy. :-) At only $12.99 for 200 pages it's a great value! The Diamond order code is JUN090671. 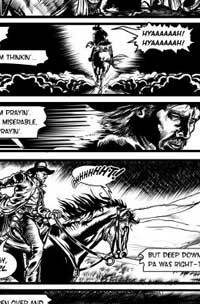 You can view a preview of our story "The 7th Shall Rise Again" in the comics gallery. Just click the page image on the left. Western Is On The Shelves! For right now those shelves are only in the United Kingdom. Changes in Diamond Comics solicitation policies have limited its distribution state side. But you can order a copy directly from AccentUK the publisher here. 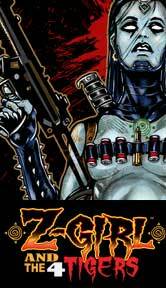 A preview version of the cover I illustrated is linked to the image above. The story I drew, inked and lettered, that was written by the very talented and critically acclaimed Dwight MacPherson, can be previewed in the comicbook gallery. I hope you enjoy it enough to order a copy to see how it ends. Not to mention getting all the other great western tales it contains. Im already at work on more contributions to the upcoming Accent UK anthologies, Predators, Victoriana, and a third super secret sequel Anthology. More about that soon. 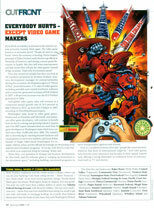 Completed this Robot Video Game Character illustration recently for Washington CEO Magazine. The article was about how the videogame industry isn't feeling the repercussions of the failing economy the way other industries are. See a full size version in the main gallery. You can also check out all the initial concept roughs over in the SKETCH GALLERY. A couple new pieces in the main gallery. 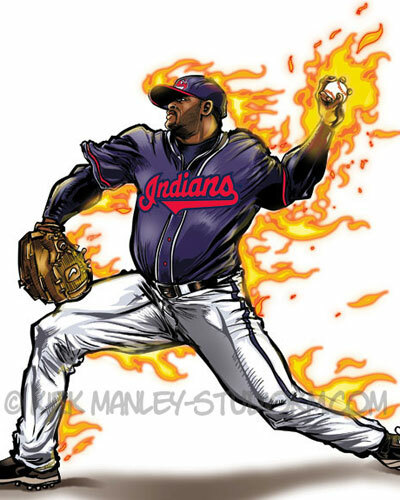 Two illustrations of baseball pitchers, One of CC Sabathia and the other of Brandon Webb. Both are for FORBES Magazine Continuing with the sports figures I have done for them in the past. You can see large views in the main gallery. 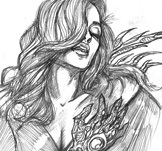 Started a new section in the Sketch Galery. Its called The Weekly Sketch and will higlight recent sketches and roughs. Check it out by clicking the banner, or the sketch thumbnails below. I finally put together a gallery of some of the vector based art I have created for GAMEALMIGHTY.COM the video game review web site. Just click the heroes chest above, or you can get there via the commercial gallery area. 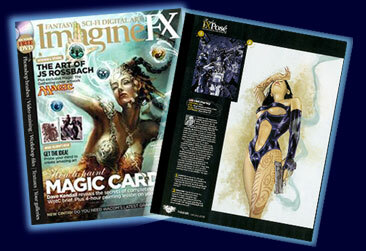 You can catch a brief profile of my process and my work in this months issue of ImagineFX Magazine. Its an international Sci-Fi and Fantasy Illustration magazine. Visit their online home here. Its a fun and informative magazine and whether your looking for how to tips or just appreciate beautiful art, its well worth the coin. Big New Years update in the Comic Gallery. Just finished posting up 3 new sequential based works. Soloist™ is a short preview book that is the basis for a much bigger story. Little Red™ is the first 6 pages of a new twist on the famous children's story Little Red Riding Hood. Tales of The Dark Knight Spartan, is the first installment in an on going single panel sequential story Im doing out of my love of all things Halo, Batman and Spacegirl. 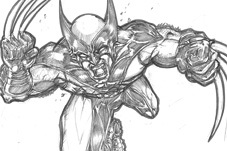 Check out the comic gallery to get a few more details and to see the work. 5 new images in the Main Gallery. All five are from a program I just finished Illustrating for Ryan Partnership and their client Englert Metal Manufacturing. 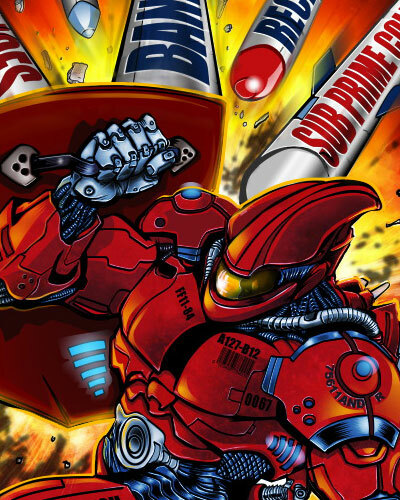 Its a fun and cool Super-Hero Ad campaign, based around their Heroic mascot METAL MAN. The ads spotlight the heroes mission to offer the Economical and Ecological rewards of metal as an alternative to more dirty and costly traditional materials. Recently wrapped up a fun project creating a cover and 3 interior illustrations for a young teens adventure book, called John Fatsramp And The Dakota 3000 Challenge. 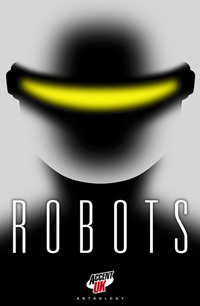 Its a great story in the Tom Swift tradition with a contemproary sci fi updating. Cool stuff ! You can check out my contributions to the book over in the Main Gallery. You can check out the book and pick up a copy over at Amazon.com. Well the site has been way over due for an update. So I have cleaned things up a bit, changed the headers and navagation a little and added a video game gallery. I have been creating allot of game oriented art lately and it seemed to make sense that it have its own gallery. Im a big fan of the Halo series and play quite regularly. So be sure to take a peek at the Halo gallery within the Games area. Master Chief and his Needler gun can take you there right now. Entertainment and Toy manufcturing Businesses. If you want to see what my spread looks like click the thumb nail below.Also visit th PLAY site where I have a 20 image online portfolio. I recently attended the NY Comic Con at the Javits Center. It was excellent and a decent Con In NY has been missing for over 15 years. To get ready I updated a number of images. I hope you will check out these revised works by visiting the Main gallery or clicking the thumbs below.